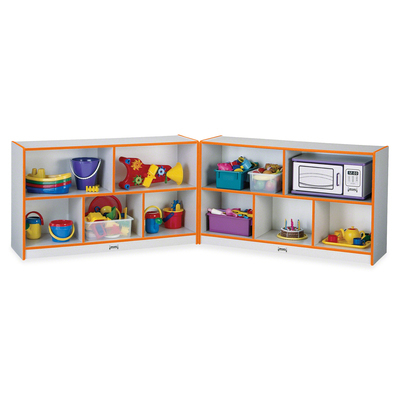 Fold-N-Lock Storage Shelf Is Perfect For Organizing Children'S Books, Toys, Games And More. Wings Fold Together And Lock For Security And Easy Mobility. Laminate Is Durable And Features An Easy-To-Clean Surface. Full-Length Piano Hinges Prevent Small Fingers From Being Pinched When The Shelf Is Opened Or Closed. Maxbrackets Allow The Art Center To Be Moved Easily From Room To Room Without Causing Stress On The Wheels And Brackets. Wheels Are Made Of Hard Rubber And Won'T Leave Black Marks On Your Floor. Truedge Is Permanently Thermo-Fused To The Edges To Prevent Chipping. Kydzsafe Rounded Edges Allow Children To Play Safely Without Getting Hurt By Sharp Edges Or Corners. Kickplate Prevents Children From Losing Small Items Underneath. Write-N-Wipe Recessed Backs Can Be Easily Wiped Clean..
Fold-N-Lock Storage Shelf Is Perfect For Organizing Children'S Books, Toys, Games And More. Wings Fold Together And Lock For Security And Easy Mobility. Laminate Is Durable And Features An Easy-To-Clean Surface. Full-Length Piano Hinges Prevent Small Fingers From Being Pinched When The Shelf Is Opened Or Closed. Maxbrackets Allow The Art Center To Be Moved Easily From Room To Room Without Causing Stress On The Wheels And Brackets. Wheels Are Made Of Hard Rubber And Won'T Leave Black Marks On Your Floor. Truedge Is Permanently Thermo-Fused To The Edges To Prevent Chipping. Kydzsafe Rounded Edges Allow Children To Play Safely Without Getting Hurt By Sharp Edges Or Corners. Kickplate Prevents Children From Losing Small Items Underneath. Write-N-Wipe Recessed Backs Can Be Easily Wiped Clean.